Many times while we use Windows we have to use the Run Command dialog of Windows from Start Menu, examples include launching registry editor, services management, group policy editor and etc. The usefulness of Windows start menu run command prompt is that we can launch the above mentioned applications quickly. Imagine what if you can open any file or folder from Windows start menu run command dialog box, will that not be quick and easy? If yes AddToRun is a free tool using which you can launch any file or program from start menu’s run command dialog. 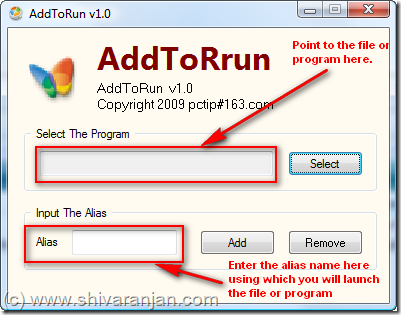 To launch a program just run the AddToRun program and then point it to the file or program that you want to launch from Windows start menu run command and select an alias string using which the file or program will be launched. Once this added then you have to just the alias name in the Windows start menu run command dialog to open the file or program. At any point you feel you have to remove a file or program use the remove option to remove the entry. This application does not require any installation hence can be run from portable USB flash drive. We tested this in Windows XP and Windows Vista.